STEFANIE Hale is being swamped for orders across her delicious range of desserts, and her business isn't showing any sign of slowing despite widespread reports across the Bundaberg region of a declining retail market. 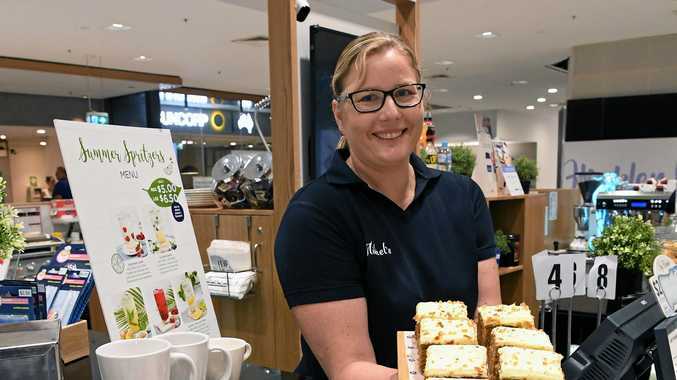 Stefanie said her store, Michel's at Hinkler Central, had experienced an unprecedented start to the sales year with orders through the roof, particularly for one of her signature specialities. "The carrot has long been touted as a delicious vege for dinner and thrown into your lunch time salad, but it goes so much further than that, she said. Full of vitamins and fibre, Ms Hale said it came as little surprise to her that many customers kept coming back for her own favourite, the carrot cake, and accompanied by coffees - and lots of them, with Ms Hale estimating nearly 1500 last month. "We've sold 99 carrot cakes in recent weeks - that's a lot of carrot,” she said. Since buying the business, Ms Hale said she'd introduced freshly made sandwiches and salads. Growing up, she said she always surrounded by food. "Before I became a franchisee I was in property renovation for more than six years and worked in the local post office,” she said. Today, both Stefanie's daughters, 15 and 17, are reliving the same baby steps as they work alongside her in store. "We're a team of 12 here at Michel's Bundaberg and we are like family. We treat each other as one and we all value customer service,” she said.